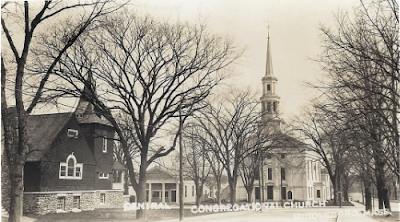 The photograph depicts the view down Nickerson Avenue towards the Central Congregational Church. To the left is the Unitarian Church. The original four-columned Congregational Chapel appears to the left of the Congregational Church which superceded it. The chapel building was moved to Webster Street when the Middleborough Co-Operative Bank (now the Mayflower Cooperative Bank) was built in 1927.